Reports say that at least 12 people were killed in demonstrations across Turkey, local media reported, as Kurds demanded the government do more to protect the Syrian-Kurdish town of Kobane from Islamic State in Iraq and the Levant (ISIL) fighters. Police fired tear gas and water cannon to disperse protesters who burnt cars and tires as they took to the streets mainly in Turkey’s predominantly Kurdish eastern and southeastern provinces late on Tuesday. Earlier, Turkey’s president, Recep Tayyip Erdogan, had warned that Kobane was about to fall into the hands of ISIL. 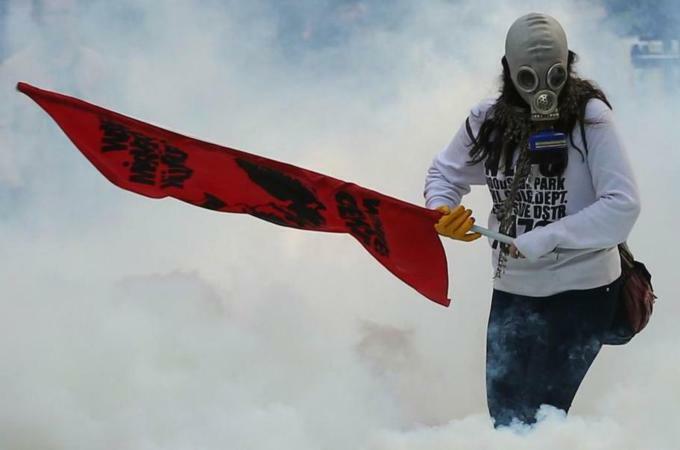 Clashes also erupted in the capital Ankara and in the country’s biggest city, Istanbul, where almost 100 people were detained and 30 people were injured, including eight police officers, the Istanbul Governorship said in a news release early on Wednesday. Five people were killed in Diyarbakir, the largest Kurdish city in the southeast, which saw clashes between protesters and police. A 25-year-old man died in Varto, a town in the eastern province of Mus, and at least half a dozen people were wounded there in clashes between police and protesters, local media reported. Two people died in southeastern Siirt province and another died in neighboring Batman, according to media reports. Authorities announced a curfew in Kurdish populated districts in Diyarbakir, Siirt and in the town of Van, where thousands of protesters rallied against ISIL’s advance on Kobane. Last Wednesday, Erdogan promised in a speech that Turkey would fight ISIL and “other terrorist organisations”. The president’s vow came a day before the Turkish parliament granted authority to send forces into Syria and Iraq. The Turkish army, however, has so far not intervened in the heavy fighting across the border. Turkey is not a part of the US-led coalition, but has sent tanks to border areas threatened by ISIL advances towards Kobane. Kurdish forces have been trying to stop the group’s advance for weeks but on Monday ISIL fighters entered the town from the south and east and raised their flag over a hill and a building near the Turkish border.